Penn Yan Aero recommends these time tested, FAA Approved STCs. And, the best time to add one of these STCs is at overhaul time. They’re an excellent way to improve your aircraft, add to its value, and increase your flying pleasure. Increase your flying pleasure and the value of your 1968 - 1986 Cessna 172 Models I, K, L, M, N, and P with 180 Horsepower. Test results from the Penn Yan Aero Cessna 172 test plane showed an increased cruise speed to 151 mph; a decreased takeoff distance to 400 feet (700 feet with a gross weight of 2,400 lbs. ); an increased rate of climb to 1,020 feet with gross weight at 2,400 lbs. ; a ceiling of 19,500 feet; and a gross weight capacity increase up to 2,550 lbs. The SuperHawk STC allows for the conversion (via Penn Yan Aero overhaul) or replacement (with a Lycoming factory new engine) of your 150 or 160 horsepower O-320-E2D, O-320-D2J, or O-320-H2AD engine with a 180 horsepower O-360-A4M engine. The STC includes a new Sensenich propeller, STC paperwork, and all of the hardware needed to complete the conversion which will add about 25 hours to the normal removal and installation time. Penn Yan Aero has provided thousands of the SuperHawk conversions to happy, satisfied customers worldwide since its inception in 1983. There are three ways to get the SuperHawk engine in your 172. Option One includes Penn Yan Aero's warranty: Three years, 100% parts and labor or to Lycoming’s maximum recommended time between overhaul (TBO), whichever comes first; supported worldwide and transferable from one owner to another. Free round-trip shipping from and to any address in the contiguous United States as per Penn Yan Aero’s Shipping Policy. 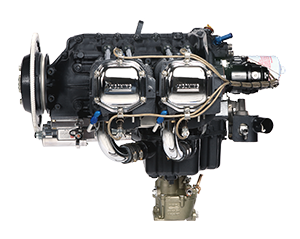 Exchange your 0-320 Lycoming engine for a Lycoming factory new, zero-time Lycoming 0-360-A4M SuperHawk specification engine with a zero time logbook. This option requires up to a 120 day lead time and includes the SuperHawk STC Kit (everything needed including propeller) and Lycoming’s engine warranty. Shipping is not included with this option. The SuperHawk Kit - Everything listed in Option One except an engine: Kit, STC, Instructions, Hardware, Sensenich Land Propeller. Shipping is not included with this Option. The SuperHawk kit is optionally approved and available for seaplane applications.